Country Bread is my second bread this November for Mellow Bakers. The others are the Horst Bandel rye bread and a brioche which I am saving for the end of the month. If you want to join in with this escapade, you can get advice, give advice, and talk bread in general on the Mellow Bakers forum. We’re very nice and friendly, jump in at any time, bake any of the breads you fancy, either one for this month or a previous one. Then post on a blog or on the forum direct. You can upload pics if you feel like it. And if you need cheering up, you can always visit the bread disaster thread too and see my very first loaves. 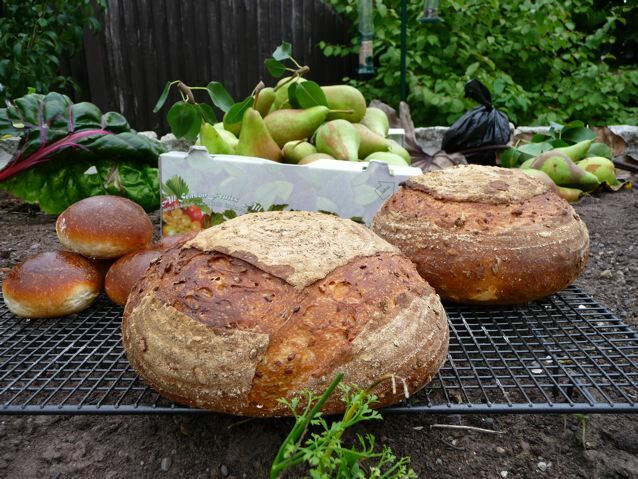 The Country Bread is a plain dough made with white bread flour, water, yeast and salt.There are no enrichments, no milk to sweeten and soften the crumb, no butter or oil to coat the gluten strands, no egg, no malts. The recipe uses a paté fermentée, as we have done previously when making Rustic Bread, or for pizza. I quite like using old dough in new dough usually but on this occasion I wasn’t that excited by it if I’m honest, the difference between this bread and the Rustic Bread is gigantic. Tiny amounts of yeast, long prefermentation of half the flour in the final dough, fairly wet, quite a lot wetter than the doughs we have been making up to now. Needs lots of stretches and folds to bring it under control and I suspect the temperature control is fairly important too otherwise your timings go way off. Drop the dough temperature by four degrees and your proof time will need to be extended and so on. I used my local supermarket, Waitrose Organic strong bread flour for this bread. You need something with a reasonably good gluten level to cope with the long prove time. The loaves I made here are certainly good enough to eat, but in a way they remind me of loaves I made when I started out. They stuck a little in the banettons, probably because I dusted them with wheat flour and not rye flour and they spread a lot when I inverted them onto the peel, the knife dragged when I slashed them so I knew they weren’t going to open up properly. They recovered fairly well in the oven; the Angel of Spring doing her thing as always. If this had been one of the first breads I had made I would be really pleased with this – but I know I can make better tasting bread than this. So before anyone says, oh they look fine, I agree! Yes they do look fine and rustic and all that sort of thing, I am not complaining, just telling you how it tastes from where I am, the photos don’t tell the whole story after all and sometimes the photos make the breads look better than they really are. Taste wise:- This is a bland bread with a good open crumb, irregular holes and a chewy crust. Maybe it needs a little more salt, maybe I should have added some of my sourdough starter to it to give it some flavour, it needs something, the long pre-ferment didn’t do anything for it tastewise. The biggest effect of the long pre-ferment and proves is on the texture of the bread, which is very similar to what one get with a white sourdough. So if you want a bread with the open, slightly chewy texture of a typical sourdough but a very mild flavour this is the one for you. It’s not the one for me. If I’m going to spend that much time monitoring a dough, stretching and folding and so on, I want to get great bread, not just a good enough bread. … Looking forward to making that brioche, a few quick marches to burn off the calories first….. This entry was posted in Bread, Mellow Bakers and tagged Country Bread, Food, Jeffrey Hamelman Bread, Mellow Bakers, paté fermentée, prefermented dough on 18/11/2010 by Joanna. It’s that bread again! (the long slow baked rye grain bread with the great back story in Bread by Jeffrey Hamelman) which is one of the Mellow Bakers November breads. I posted my last year’s version of this a little while ago but I have made it again – practice, munch, practice. It’s fun! I had a long think about how you could manage this bread without a pullman. I think the answer, (and I will make it a third time to test it out by the end of the month I hope) is to use a regular loaf pan and once the dough is in the tin, grease and flour a sheet of foil, and place it over the top of the tin and either wrap the whole tin in foil tightly or tie it on with string round the rim of the tin. Alternatively if you don’t mind what shape your bread comes out, use any bake proof container that has a sealable lid, so a pudding basin or a cast iron pot or something like that. The key thing is to keep the moisture in during the long gentle bake. Make sure the grains (use wheat if you can’t get hold of rye) are well soaked and really well cooked so they are plump and moist and soft. They act as storage for the water during the bake. Slice the old bread thinly and bake it a bit more in the oven before you soak it. Only use as much water as you need to cover it; you are only going to have to squeeze the water out later after all. The hardest bit is judging how wet to make the dough, too wet and the bread will never really dry out enough, too dry and it will be a bit chewier than you want. That’s not very helpful but everyone’s combination of grains and breads is going to vary. I think I would want to go for a dough that I can shape into a baton that I can pick up without it breaking apart the moment I lift it from the bench, so go for firmer rather than wetter. I have a milk loaf tin which has a clip on lid so I thought I would try it out in that. In my mind the bread would rise, slowly into the top half and I would have incredibly sophisticated round slices of bread, perfect for canapes. The drawback, pretty major, of these tins is that you can’t open them to check on progress. There is a tiny peep hole in the top of the tin – once the dough is at the top you can see it. This dough didn’t get that far. I stuck a toothpick in the hole every so often to see if I could judge where it had got to, but it never got right to the top. In fact I overproved this one by about 6 hours (!) and you can see the results here. I don’t think it made any difference to the bread though, in fact it might have improved the flavour a bit. So I ended up with a half round loaf. This time it was completely cooked through and very even in texture. Still not as dark as I would like it to be to justify being called ‘black rye’. I like the taste, much milder than I thought it was going to be; sweet and nutty and very fragrant. This entry was posted in Bread, Mellow Bakers and tagged baking, Horst Bandel, Jeffrey Hamelman Bread, Mellow Bakers, rye bread on 04/11/2010 by Joanna. Journeying through the wonderful collections of breads in Bread by Jeffrey Hamelman, from time to time I come across a bread that simply doesn’t resemble the bread I associate the name with. This challah is a prime example of this. Challah in my childhood was a soft, dense white bread, plaited tightly and tasting of poppy seeds. Whether England was still in the post-war egg rationed mode in the early 1960s, I don’t know. Today’s American challah bread I can only describe as a butterless brioche, light as an angel’s feathers and almost ethereal. I doubt my grandparents would recognise it. Celia has created a beautiful tutorial showing how to braid a Winston Knot. How could I fail with that guide? I printed it off and kept it close by while I made the first braid. I almost panicked when at the bottom of page 1, I could only find page 3 – I squawked and then found page 2 which had got stuck to the back of page 1. Disaster averted but it was close. So here are the pictures of my challah adventures for Mellow Bakers this morning, not quite as hard as it looks but still required some serious concentration. I mixed the dough in a Kenwood mixer. I put the eggs, water and oil in first, added the salt and sugar to that. I added the yeast to the two flours separately and then added the dry to the wet, that’s the way the Kenwood likes it. I also hand kneaded the dough for about 3 minutes once the Kenwood started rocking about. The dough was left in the fridge for a couple of hours, but there is so much yeast in it that it still had to be knocked down every 40 minutes or so. I am sure one could make this with less yeast! I made the braids for the Knot 150 grams each and rolled them out to 60 cms long having been forewarned. This left me with 800 grams of dough for the 6 strand plait so they were smaller at 133 grams each. Even so both loaves were huge by the time they had proved and baked. I showed them off to my neighbour and then gave her the Winston Knot to take home. Too much bread for us and no room in the freezer for such a monster. The other bread which was a 6 braided loaf was easy by comparison. So don’t be afraid, well don’t be too afraid, if a braid-phobic like me can do this, you can too ! This was one of the October breads for Mellow Bakers. Thank you to all those of you who have already baked this, by watching and learning from you all I have gained so much. This entry was posted in Bakers, Bread, Mellow Bakers and tagged 6 strand braid, baking, braiding, Bread, challah, enriched dough, Jeffrey Hamelman Bread, winston knot, yeasted dough on 24/10/2010 by Joanna. Potato, almond meal, rice, tree-bark, many other foodstuffs besides grains, get added into bread. This has a historical precedent; when times are hard and wheat expensive, it is common practice to bulk out the dough with a locally available and probably cheaper ingredient. This bread is a reminder of those times according to Jeffrey Hamelman. It’s a good idea to keep these thoughts in mind; climate change will bring many changes to the grains we have available to bake with and the way the world thinks about food. I chopped the potato up, skin and all into 1 cm cubes, and roasted them in a shallow dish in the minimum of olive oil for about 25 minutes while I was cooking something else in the oven. I added at least another 50 grams of water as my flour was very thirsty and the dough was very tight when I first mixed it. All was going well and then I had to go out, so I put the dough in the fridge after the first hour at room temperature. Three hours later I returned, and rescued the dough. I flattened it out gently and folded it. After half an hour I divided it into two portions, rounded them up and popped the dough into bannetons which I left in a warm spot in the kitchen. Life intervened again and when I finally came back to the kitchen two hours later they were well and truly risen, so I baked them as soon as the oven was up to temperature. They didn’t appear to be overproved, the slashes opened and they rose nicely in the oven. I loved Abby’s pattern on her loaves so I thought I’d try and do that. These loaves had very thick crusts, which surprised me a little, given all the steam and were quite difficult to cut the first day. By the following day, the crusts had softened and the bread had developed more flavour and we are still eating our way through them happily this weekend. Strangely I can’t really taste the potato as a separate taste, it adds something but I can’t describe it. One can see the great colour the roast potato lends to the loaf , plus it adds a sort of unctuous chewy mouthfeel as well, something like crumpets but not as sticky. If you would like to have a go, the other bakers have written out the formula on their blogs so no need for me to do that here, as I didn’t do anything different! And after this I really have to face the braiding of the challah – watch this space. Mellow Baking – Every Way OK. This entry was posted in Bread, Mellow Bakers and tagged Jeffrey Hamelman Bread, Mellow Bakers, roast potato bread on 17/10/2010 by Joanna. You didn’t think I was going to give up, did you? No strange ingredients this time! Only thing I did was put half light and half whole rye flour in the dough, but otherwise I measured to the nearest gram and followed the timings and was rewarded by the Spirit of the Rye! This is a classic rye bread, full of flavour. Make sure your walnuts are sweet before you put them in the dough. I broke them up a bit but maybe not enough but I quite like the way they break through the top of the dough. This was a very firm dough, I proofed it on a couche cloth having shaped it into a sort of peaked oval with my hands and it didn’t spread sideways at all. I could maybe have left it another half an hour on the cloth, who knows? Not one for those who don’t eat nuts or don’t like rye, but you can still look at the pictures. Ulrike ‘s beautiful bread with its elegant scoring, Bnom’s lovely twist with hazelnuts and figs, Cathy’s carefully detailed step-by-step post is here, and Lello‘s great midnight bread! Next month we are baking Roast Potato Bread, Challah and maybe having a play with making Pretzels. 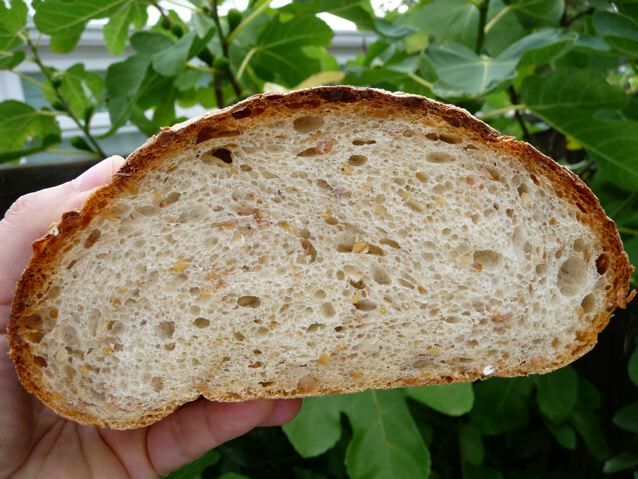 This entry was posted in Bread, Mellow Bakers and tagged Jeffrey Hamelman Bread, rye sourdough with walnuts on 24/09/2010 by Joanna. 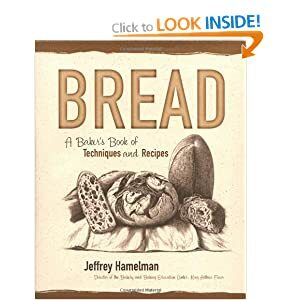 Here we go with two of the September breads for Mellow Bakers, who are baking their way through Bread by Jeffrey Hamelman in an easy going and take our time sort of way. 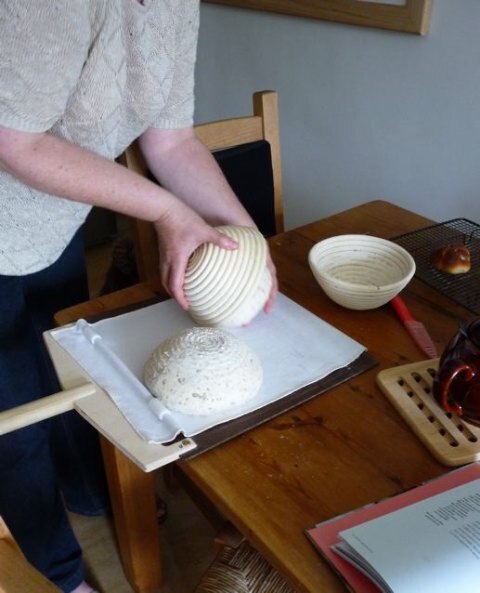 Join in, bake a couple of breads with us, bake loads, it’s all good fun! I baked these rolls a little hot, hence the colour, and they were very petite in scale. The dough took forever to prove, no idea why and I wasn’t very optimistic, but I managed to make them. Didn’t read the bit about putting them close together, if I had done that they would have risen like batch rolls and then the sides would have been soft. I only made a half batch which was plenty for us and we had them for lunch with some good Ardennes paté. You can taste the egg and the butter in them, a little like a poor cousin of a brioche, perfectly nice as a side roll goes. I would say make sure you use good quality butter if you make these as it will show if you don’t. They reminded me of meals in old fashioned restaurants with my grandparents, with stiff white linen tablecloths and dusty wineglasses; the waiters would ceremoniously bring you a teeny tiny roll, which you would try to eat slowly, and always ate really fast because you got bored waiting for the food to show up…. Some of the other Mellows said they weren’t too keen, we thought they were fine, they are what they are that’s all. I could lie a bit at this point and post a picture of the rye sourdough with walnuts, but the fact is you can’t smell pictures. The rye sourdough with walnuts was not a success. I thought I would be adventurous and added some walnut oil to the dough. Unfortunately I didn’t smell the oil before I tipped it in and it had gone stale and the smell of the bread when I had baked and cut it was so bad I had to throw it away. (weeps bitter tears….) There is a moral in that somewhere…. I might make it again one day but not just yet. To see what the bread should have looked like have a peek here at Natashya‘s lovely take on this or Andrea‘s light and open loaf and maybe visit Mellow Bakers here to see what the others come up with this month. But to cheer you up after that sad news here is a picture of Zeb instead! Please suggest a caption for me! 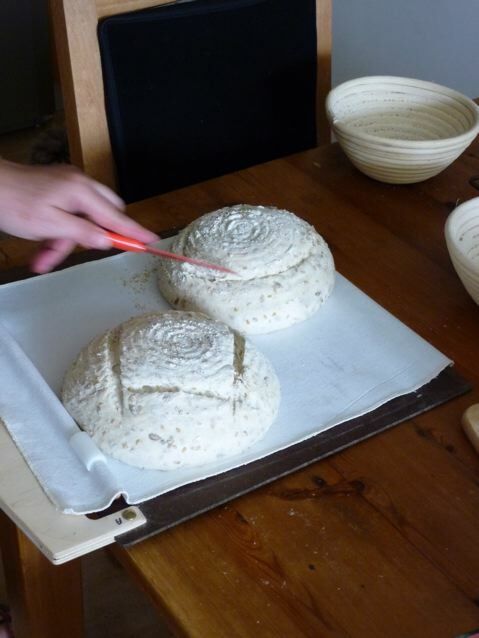 This entry was posted in Bread, Mellow Bakers, Poodles and tagged Jeffrey Hamelman Bread, Mellow Bakers, rye sourdough with walnuts, soft butter rolls, Zeb on 13/09/2010 by Joanna. Happiness is a well risen loaf of bread! This was meant to be a catch up post from the August breads for Mellow Bakers but is in fact a bread that’s not on the list. Whoops! Somewhere I have got a little muddled up so I made this bread which is not the straight five grain bread (one of August’s breads) but the five grain bread with paté fermentée on page 129 of Bread – A Bakers Book of Techniques and Recipes by Jeffrey Hamelman. Does it matter? All I know is that this was a drop dead gorgeous loaf which made me happy and stayed fresh and moist for three days, we have half of one left and I will definitely make this one again. It’s a keeper. 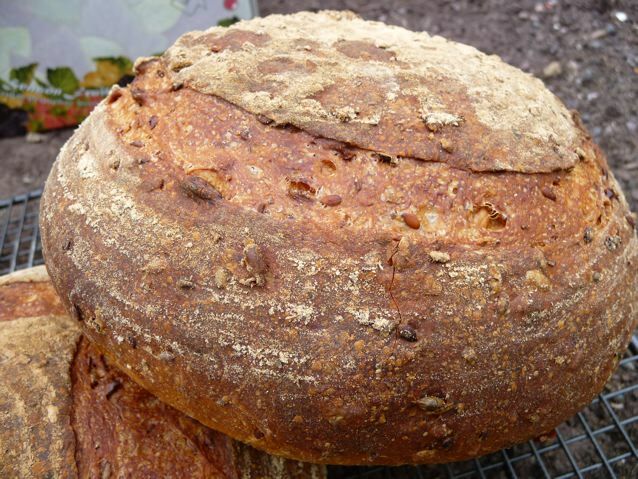 It reminds me of the light rye with its light crumb and full flavoured crust, just enough seedy interest and with the extra boost to the flavour from the old dough. Wonderful stuff! The grains are exactly as written in the recipe, a mixture of golden linseed, chopped rye, oats, sunflower seeds and wheatflour – a cold soaker, nothing complicated; all mixed into the yeasted dough and then finally the paté fermentée, which is just a fancy way of saying some old dough. At this point I confess freely that I deviated from the recipe and excavated a solo ball of Abby’s pizza dough out of the freezer, defrosted it over night and used that. Old dough is old dough and I figured the hydration would be ok, the pizza dough is about 70% (factor in evaporation, time in freezer – I’m kidding, right?) and the formula calls for a paté fermentée of 65% hydration. I got a little water and painted it into the slashes to distract them while they waited, and the boules were very good and just sat there and didn’t move for ten minutes while the oven guiltily heated up and then in they went. I got my reward then, I just sat there in front of the glass door and watched them spring and sighed with happiness. Once they were done I took them outside to meet the pears which we were hastily taking off the tree in anticipation of stormy weather. It’s all go here! What? You want a crumb shot too? OK.
Make this bread – it’s delicious! This entry was posted in Bread, Mellow Bakers and tagged Five grain bread with paté fermentée, Jeffrey Hamelman Bread, Mellow Bakers on 07/09/2010 by Joanna.